It’s a near-40 mph sprinter that’s a weekender at heart. 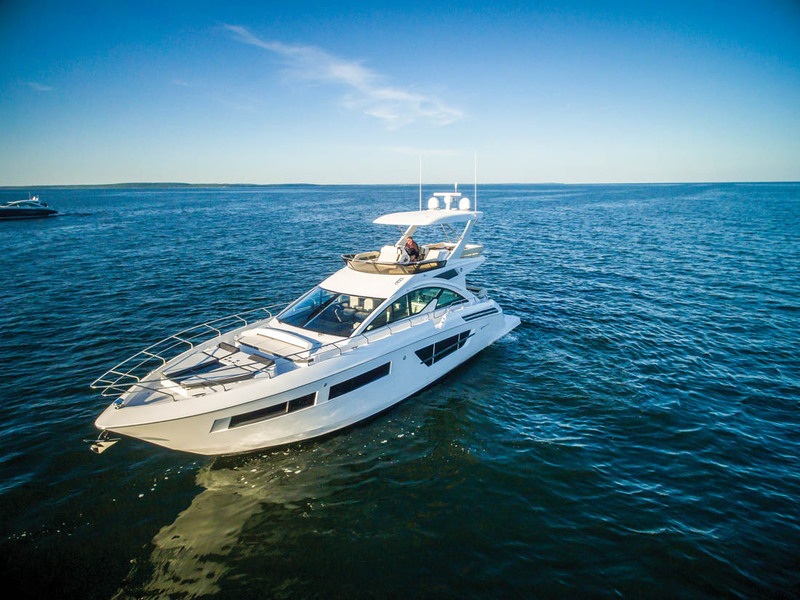 Cruisers Yachts made a splash last year with the 60 Cantius, a new flagship for the Cantius line, and almost exactly a year later, the Oconto, Wis.-based builder introduced the 60’s companion yacht, the 60 Cantius Flybridge. Cruisers’ designers kept the sleek look of the original 60 even with the addition of a flybridge, by maintaining the swept-back angle of the windshield and keeping the Egyptian-eye-like cabin windows. The wind screen on the bridge itself is a low, Euro-style, forward-leaning one, which cuts down on the profile and keeps the yacht sleek. Since the flybridge is brand new, that’s where we’re going to begin, so climb up the steps from the starboard side of the cockpit. By my count, the minimum head count the bridge can accommodate is seven, and that’s if three people bogart the seven-person settee aft, two people stretch out on the port and starboard settee/chaise lounges, the captain takes the doublewide helm seat for himself, and one person spreads out on the two-person sun lounge forward of the helm — a touch that is a continuation of a feature found on the original 60 Cantius and this new model, but more on that soon. If everyone shares space, about 15 people can find a spot for their rear end. A console with an electric grill and a drawer freezer is immediately aft of the helm seat, and a separate console with a sink and a small refrigerator is to port. The yacht’s bow includes a four-person settee and two large sunpads that recline. Operating the yacht from the centerline flybridge helm is simple, and will likely be the preferred spot on nice days. 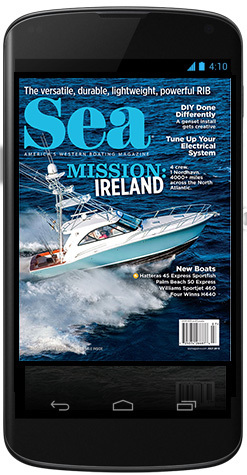 It’s covered by the hardtop but open to the wind and water, and the console includes a Raymarine touchscreen MFD, a Volvo engine display, a Seakeeper display, a stereo head unit, a VHF radio and more. Atop the console is a compass and the Volvo joystick. Some people might find that an awkward placement for the joystick, but a lot of skippers like to stand and look around during docking, so it makes sense in that situation. Cutouts on either side of the console include three cupholders each, so there is plenty of beverage storage. Cruisers knew it was on to something good with the bow on the original 60 Cantius, so designers kept the arrangement. Two sun beds hold a place of prominence. They both recline from about 45 degrees to flat, and a canopy can be deployed to keep the sun off their occupants. Between them is a heavily tinted glass hatch to the forward stateroom, three cupholders and a built-in cooler that is within reach of folks on the sun beds and those sitting on the settee. Immediately aft of the sun beds is a settee with room for four people. Two small removable tables will hold a few drinks and snacks. When the boat is at rest, this is sure to be a popular hangout spot. On the other end of the yacht, passengers will find another sweet spot to hang out. A six-person C-shaped settee is on the transom and includes a high-low table with four cupholders. Forward of that is a built-in console that houses a grill and two barstools that seem to be out of place — but looks can be deceiving. Two-thirds of the bulkhead between the cockpit and the galley/salon is glass, composed of a door near the center and a large window to port. The door opens and latches, but the window is what makes the bulkhead special. The top half of it lowers into the bottom half, with the simple push of a button, to really open things up, and with it lowered, the aft countertop in the galley becomes a bar for the stools, thereby ending their seeming exile. It’s a clever, social-friendly arrangement. Moving belowdecks, we find what will likely be one of the yacht’s biggest selling points, at least as far as the owner is concerned. And really, who matters more than the person writing the check? The master stateroom is an amidships, full-beam retreat that takes full advantage of the huge hull windows to remain well-lit and have nice views of the water. 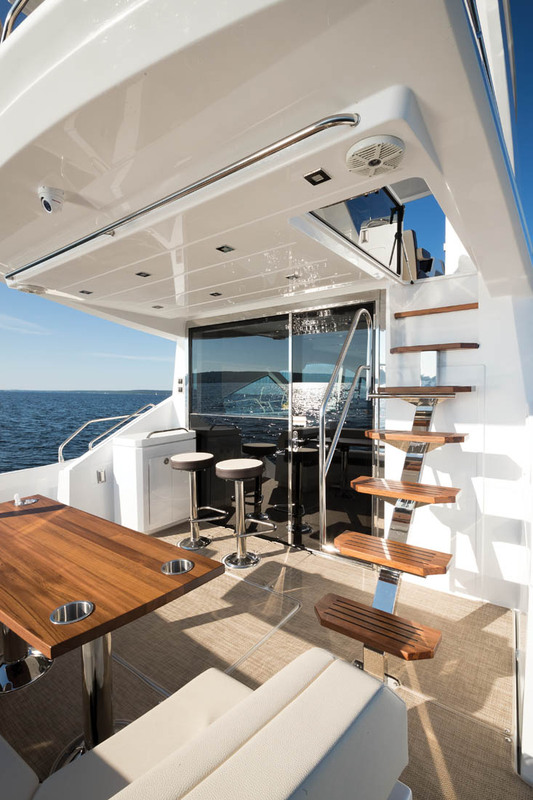 To starboard is a nice seating area/breakfast nook, while to port is a seven-foot-long built-in bureau with storage in drawers and behind doors. A refrigerator occupies the forward quarter of the under-bureau storage. The king-size bed is against the center of the aft bulkhead. The master head includes twin sinks, a shower stall and a Dometic toilet. What’s likely to draw attention is the master closet. The one on our test boat was just outside the entry to the stateroom. It’s full height, it’s about six feet wide, and it features built-in drawers, cubby holes and shelves. It even has a window. Forward is the VIP stateroom, which might have been the master if not for the Volvo pods, which allow the engines to be placed farther aft than with traditional shaft drives. Hull windows run nearly the length of the space, and a tinted overhead hatch lets in even more light. The centerline berth is roughly queen size, and a hanging locker is to starboard. The VIP has direct access to the second head, which it shares with the third stateroom, which is immediately to starboard in the foyer at the base of the stairs from above. Bunks occupied the space on our test boat, but owners can option it as a lower salon, which is a good match for the wet bar across from it. The foyer area is well-lit thanks to the windshield above, which starts a fair distance in front of the helm and angles back, creating a bit of an atrium effect below. 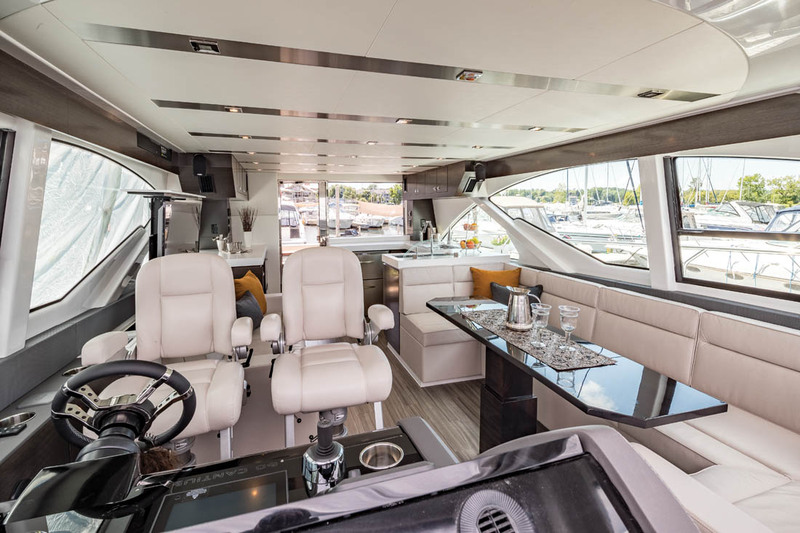 Even with all the great social spaces on the 60 Fly — the bow, the cockpit, the flybridge — the main cabin can hold its own. Two settees, a sofa to starboard and a C-shaped settee to port, have room for eight people to sit comfortably. The port settee has an expandable table for formal dining, and while there is room for up to six people to sit, four is a better number for dining. 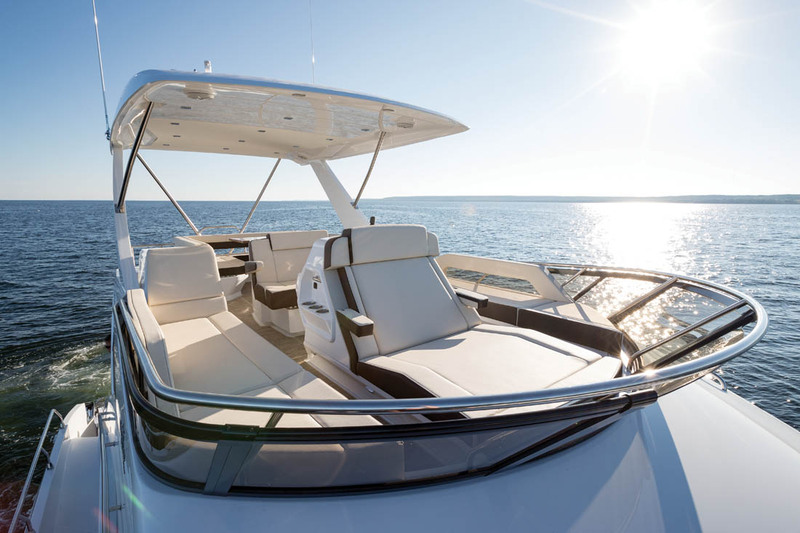 Twin captain’s chairs sit at the helm, which consists of a modern looking console — black, gray and stainless — with Raymarine glass bridge MFDs, engine gauges, a compass and a stainless-and-leather sport wheel. The engine throttles are immediately to the outboard side of the steering wheel and just aft of the dash, making it easier to reach during actual operation of the vessel. There is a bit of fiberglass in the cabin walls, mostly there to hold the uniquely shaped window glass in place. Even though the addition of the flybridge eliminated the huge sunroof from this yacht, plenty of natural light pours in, and with the aft bulkhead and two side windows open, air streams through to keep the atmosphere pleasant, though there is air conditioning to handle that job in a more modern fashion. Aft of all that seating is the galley, which stretches across the cabin in two sections. 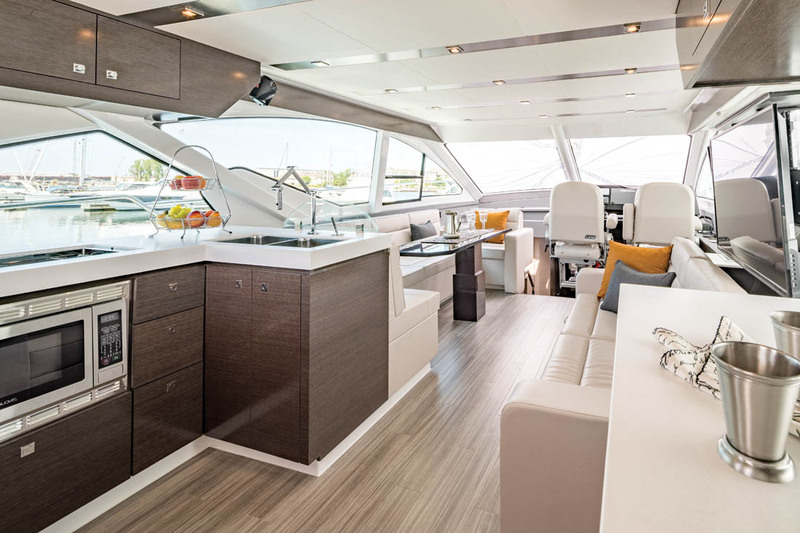 On the port side, the chef will find a U-shaped countertop, a microwave/convection oven, a double sink, a two-burner stovetop, and refrigerator and freezer drawers, with cabinets above. The starboard side features another refrigerator/freezer drawer unit, and a drawer-style dishwasher underneath a countertop. More cabinets are above. The grill in the cockpit completes the food-prep accommodations. We had about 15 people aboard both times I took a run on the yacht, so the numbers I gathered are slightly different than the numbers the Cruisers and Volvo people registered with just three people aboard. The standard engines in the 60 are Volvo Penta IPS950 diesels, each capable of cranking out 725 hp. At 2100 rpm, we reached 25.8 mph on test day, but the same rpm yielded 27.9 mph for the Volvo folks, and that’s to be expected. Fuel burn at that speed was roughly 46 gph, yielding a range of about 350 miles. Speed jumped to 32.8 mph at 2300 rpm, with a fuel burn of 56 gph, and top speed was 38.4 mph for the Cruisers/Volvo team at 2560 rpm, where a 71 gph fuel burn yielded a 310-mile range. It even has longer range coastal capabilities if the owner is willing to slow down. At 10 mph, its range is around 570 miles. 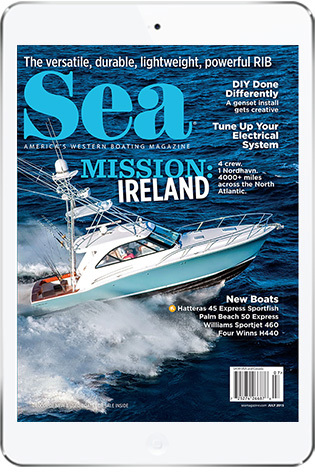 We spent very little time at WOT, in deference to the flybridge being packed with people and the diesels still being very, very new, but we did crank the wheel hard over a few times closer to cruise speed — Hold on! — and the yacht exhibited an inward lean somewhere between sportboat and no lean. It was aggressive enough to make passengers take notice but not so much that folks on the flybridge had to worry about being dumped. Sturgeon Bay was calm on test day, so we had to create our own waves to try out one of the yacht’s best hidden features: the Seakeeper gyro. We pulled a hard turn and circled a couple of times to create as much wake as possible, and then the 54 Cantius buzzed by to add its wake to the conflagration. Our captain then stopped in the middle of the confused waves and let the gyro do its thing, which it did, holding the 60-footer solid and level. Every time I’m on a Seakeeper-equipped boat I’m impressed by the gyro’s performance. 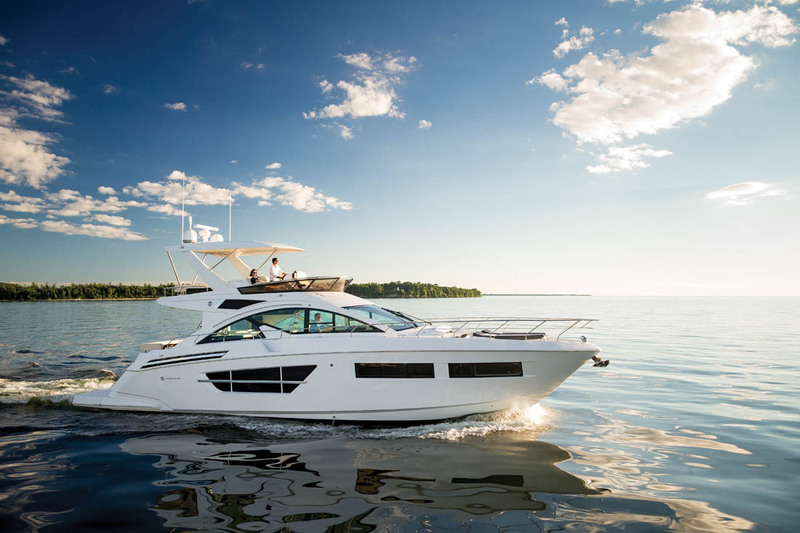 The 60 Cantius is instantly recognizable as a member of Cruisers’ signature line, from the unique bow setup to the spacious and luxurious interior. While the addition of the flybridge expands the yacht’s entertaining and dayboating possibilities, it remains an almost-40 mph sprinter that’s a solid weekender for a couple or a family. LOA 59 ft., 10 in. Draft 4 ft., 2 in. 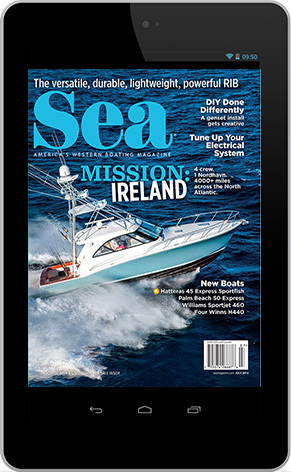 This entry was posted in Boat Tests, New Boats and tagged motoryacht, flybridge, Cantius, motor yacht, cruiser, cruisers by bsheehy. Bookmark the permalink.